Rob and Marg asked for the October Business Week by the Northern Terriory Gorvernment to promote small NT business and as you see we did and proud of it. • We haven't in the past pushed our customers to enter a trip review. • As you may now be aware we have 25 years experince in this industry and one of original the founders of the Australia 4 Wheel Drive Rentals dedicated agents industry. • To us if a customer who has travelled and appreciates our local knowledge, 20 plus years of expertise and real personal service and wishes to email back a comment then we will post it. • We have seen to many sites powered by overseas SEO houses with 100's review's such as 'Great trip John Wantirna' - come on folks if a customer emails us back and they don'tt just say a few words normally it's a lot of feedback. See our very own original authentic Trip Reviews below. • As such here are a few of our 20 plus years in this industry and specialist agents and one of the original the founders of the Australia 4 Wheel Drive Rentals dedicated agents industry and sending our valued customers automated Google review submissions 'hmmm' we are debating on that. • As true Territorians we are Darwin based. Over the years we have had much feedback. So we have listed some of the earlier ones to show you we have been around for awhile. • We have 20 plus years Top End Experience in tourism. • In compliance with the new 2014 privacy laws no full contacts details will be displayed here. • Folks we have great feedback and Trip Reviews going back over 12 years here. That's 3 times longer than some of our main competitors have been in business. Thanks heaps Rob and Marg, That is really helpful. So many places to see. To: Robert Berude Subject: are you still doing 4WD rentals? Hi Robert, It's been years since you helped us with renting a 4WD to visit Kakadu. At that time we discovered that your Mum and Dad used to know my mum and dad. You were most helpful with helping us organise a 4WD camper. Thank you very much for your time on the phone earlier to discuss the rental in detail. I have entered my details and looking forward to our trip. Your customer service skills are outstanding - 5 stars! Hi Marg, Just a quick email to let you know how much we LOVED the tour! We all enjoyed every minute of it. Rick is a great tour guide and a real asset to your company. We are very happy the tour went ahead even though it wasn't fully booked, this is great service. We will be back for another tour, the Kimberleys is next, hopefully in 2017! Would it be possible for you to pass a message on to Rick at all? I sent him a picture in a message on Facebook but I don't know if he checks it. Could you perhaps let him know it is there? Also while we were at Florence Falls we found a camera on the rocks which had been retrieved from the bottom of the pool. It had a memory card in it still and Mick would like to let Rick know that he got it working and we could see all the holiday pics of a young couple. But we can do better than that! We created a page on Facebook and started a search for these people....and we found them today!! I have spoken with our friend in Darwin and he is taking a week off to join us so we will not require a vehicle. Marg, Just to let you know that the maps arrived yesterday. Hi Rob, We had a fantastic trip from Darwin to Perth. We could never had a better car than this. The last thing we need te do is deliver the car in Perth. Hi Rob and Marg, The trip is going really good so far. Thanks for the books you send us. The car is amazing en drives super. Thank you very much for all the details and your support, much appreciated. We understand now that there is a camper for us available. This is great, it seems to be a very good product with many nice feature, all you need for visiting all the beautiful National Parks in Australia, and also great service on your side. 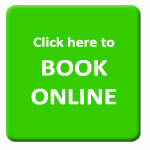 Therefore we booked today directly over your website. Hi Marg Thanks for the email much appreciated hope you got the signed copy ok, thank you to you both for the excellent service. Regards, Stan. Thanks so much for all your assistance we had a absolute ball for past 10 days from Uluru to Darwin. Now relaxing for our last night at the Novatel on the Esplanade. We have many great shots from Uluru to Darwin and happy to share with you. Dear Rob and Marg, How are you both? 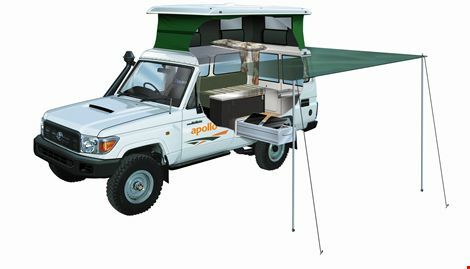 When first planning our camping trip we spoke to various Rental companies who specialise in hiring out 4WD campers and motorhomes. However, from our first phone conversation with Rob and Marg of Australia4wheeldriverentals in Darwin we felt assured that they were the ones we could trust to organise all the necessities and finer details,so that we could fly in from QLD one day ,and embark on our two weeks of travelling and camping along the Gibb River Road the next. We were not disappointed! Not only was everything efficiently organised for us, Rob and Marg were so helpful in the weeks leading up to our arrival,sending us interesting maps and books,answering our many questions and helping with practical local advise-all in such a friendly and good natured manner .Their generous welcome and assistance on arriving in Darwin was just wonderful. We would have no hesitation in recommending Rob and Marg to anyone planning to hire a vehicle to explore the TopEnd. 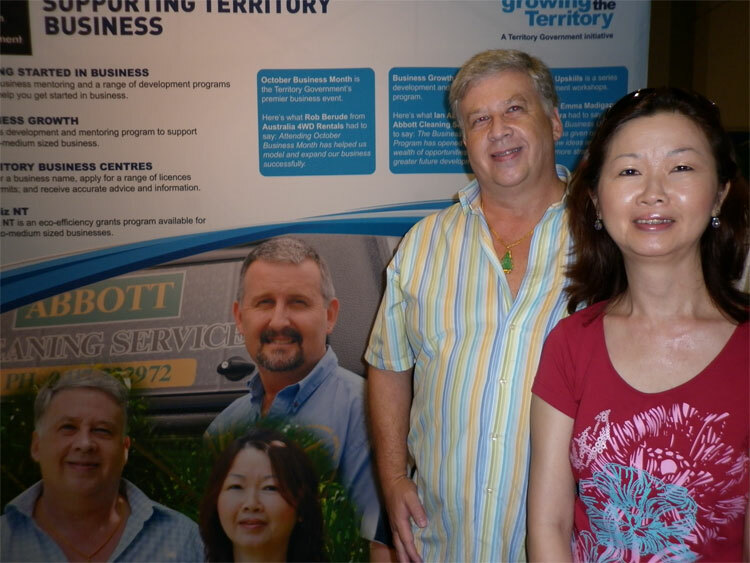 Photo's of Glen and Barb with Rob and Marg at the sunset markets in Darwin July 2009. Aldo Glen and Barb's 4WD Maui camper at Windjana Gorge WA. Dear Rob, Pretty pictures of our Maui van at various spots along our trek. The journey was fantastic, the vehicle perfect, (what a beast) and your Hema book ideal. You're welcome to use the photo's. The 1st is Brooklyn Conservancy, the 2nd is Jowalbinna near Laura & the 3rd is Weipa Caravan Park. We are back in NZ after having a great trip in the land cruiser….a bit challenging at times but a good adventure and well worth the effort. Thanks for your help in all of this. Dear Rob and Marg what a sensational couple you guys are. your random acts of kindess to us were absolutely sensational thankyou so much guys. hope.life at the top end is good for you both. keep on reaching for the stars. you look a very handsome couple. Just letting you know we had a wonderful wonderful trip. Our pick of the spots was Gunlom..swimming in the waterhole above the falls I'm giving your contact to a friend who is planning a trip to NT next year. Just a note to let you know that our trip to the Kimberley was everything we had wanted. The only extra thing we needed was more time there but we still managed to fit in everything, including a visit to friends in Kalumburu. Thank you for all your assistance. 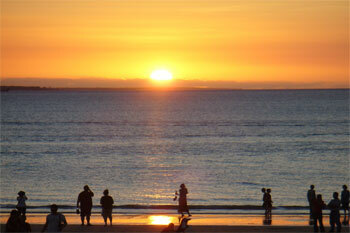 We'll give you a ring when we're in Darwin, to come and collect an outback guide. Thanks again for all your fantastic help during the past few months. See you in a few weeks. Hi Rob, I just received your package. The booklet about the Gibb River Road is awesome, lots of information and GPS coordinates. Testimonial: Hi Rob, I wanted to thank you for taking the time to secure for us a 4WD during an extremely busy time in the Territory, when it seemed there was none to be had! The extra information that you sent to our home prior to the trip proved invaluable and was a great tool to familiarise ourselves with the area. The vehicle was exactly as you said it would be, and we could not have asked for a better 4wd to suit the needs of my 15 yr. old son and myself. The recommendations that you made of other companies to deal with were spot on! Thanks again for all of the 'extras' that you did to make our relatively short holiday even more enjoyable. I have no hesitation in making the highest recommendation regarding your company and the excellent level of service and care provided by you and Margaret! Hope to see you again later this year with the rest of the family! Pat M Qld Aust. Just to inform you that we arrived safely to Perth. We had a wonderfull time all the way with no major problem. Beautifull landscape and campsite. We are now in Paris and back to "real" life. Here is our address in case you pass by Pascal P (sorry folks private) It was a pleasure to meet you guys. Hi Rob, We arrive in Darwin on Friday 29th of July at 04.30am coming from Singapore. We will stay at the Mirambeena Resort. The rest of the day, I think we will need to recover from the flight and we'll be wandering around the city center and getting our first impressions of Australia. I think it will be great to go to Parap Market on Saturday morning. I've seen some photos of it and I think it will make a great impression to us. So picking us up at the hotel, getting some impressions of the market and then dropping us off at the Maui Depot will be a great start of the Saturday. We will stay then another night at the hotel and leave on Sunday. We have just returned home after a terrific week in Darwin & Kakadu and our hired vehicle that you organized for us was even better than expected, thanks to the refrigerator which we were not expecting!! The child seat was just what we ordered and our French visitors were most impressed with everything. Many thanks for all your organizing efforts and we will certainly recommend you to anyone else we know going your way. All went really well with the campervan and everything happened as organised. Thank you very much for your help with this booking. I know you went above and beyond and it was appreciated. Will definitely use you next time we are in Darwin and am very happy to recommend your company. Rob, Just a quick note of thanks. Everything went off very well and the Britz Bushcamper was first class. I appreciated the style of service you provided and will recommend you to anyone who gets inspired by my NT stories. Thanks for your help and friendly service. Didn't get to see you in Darwin...we only just made it back in time to jump on the plane to Sydney! Wanted to let you know that we had a fantastic time. 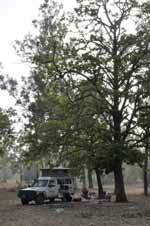 The Britz vehicle stood up to the test of the Michell Falls, Mornington wilderness camp and Gibb River Road. After cancelling the 4WD course Britz organised for Tony to have a few instuctions on 4WDriving on the beach at Broome and the fellow was great apparently ( I was not there). Our kids loved it and it will go down as one of the best holidays we've done! Thanks for all your help in organising the trip and looking after us! Hey! Rob/Margaret: Sorry this has taken as long as it has getting to you. I wanted to write you guys to thank you so much for the great trip you set up for us last month and the very courteous and kind treatment you provided while we were in Darwin. Our travel with Dave through Western AU was amazing! We visited five centers, Waringarri, Warmun, Warlayirti, Mangkaja and Mowanjum and I purchased incredible aboriginal art which is on its way to the east coast. I also want both of you know that I’m talking to my Director of Sales, Stacey K, about the possibility of having her travel to Darwin in October and then on to the five centers I visited during my trip. She would have limited time so probably would have to fly from Darwin to these centers. Since you guys are experts in the travel industry I thought it might be useful to run this by you first; maybe you can give us some advice on the most economical way to do this. Also, I’m hoping that we can continue to keep in touch as I firmly believe that the amazing work that is being produced by Aboriginal artists in the AU is going to gain a very, very wide audience here over the next several years. Thanks for the reply to our adventure tours letter. Heres the best pic I have of our time spent in Darwin with you and Marg. The ones in the restaurant were unfortunately very dark. keep in touch. Were getting lots of rain here but our feet are dry! This is just a short email to thank you both for the most enjoyable Central Australia Highlights Tour you organised for the four of us during the latter part of September. My wife and I are safely back in the UK and my brother and his wife are safely back in Canada. Long after we had finished the tour individual members would recall one of the many highlights on the three day tour. All the guides were brilliant but special mention must go to 'Shortie' and the tour to Palm Valley. His knowledge of the Outback made the trip very memorable. Sadly we did not do the rim walk at Kings Canyon but in view of the temperature that day it was in our best interests not to do it. Keep up the good work and thanks once again. Hi. I would just like to say thankyou for a fantastic tour. I recently (Wed – Fri) went on a 3 day 4wd tour to Kakadu (tour guide Shane). Myself and the rest of the group were hoping to catch up with Shane after the tour to say a few words about the tour and a big ‘thank you’ for the experience he gave us. I have traveled all over the world and have to say that this was the most inspiring and emotionally overwhelming trips I have ever done. It was extraordinary – I feel quite overwhelmed when thinking about it and being back to ‘normal’ life feels surreal. I have lived in Australia all my life and feel only now I have some understanding of her true history and beauty. Thank you for providing this experience…it is something that will live with me and has inspired a deeper connection and interest in this beautiful country. We had all hoped to catch up with Shane to express our deepest gratitude for this experience. If you could forward on this message and a sincere thankyou. His passion for his work, his knowledge of aboriginal history and culture, and the person that he is, made this such an extraordinary experience. Sincerely and deeply, thank you. Hi! Please pass this email on to whoever gathers the feedback on the tours. I have had the BEST 5 days (as did every single person on our tour) doing the TOP END SAFARI with Guide Karl Abele from June 28th until July 2nd. Really, words fail me. The guy works SO hard and not once was anything but cheerful, smiling and very relaxed. This had a positive effect on the whole group and everyone loved it and will recommend ADVENTURE TOURS to friends. I work in the cultural exchange industry and meet thousands of potential tourists to Aus each year, and will be telling them about the awesome adventures that await in Kakadu. Cheers to ALL! Hi Just wanted to send an email to say my trip to Uluru was great... The guide at Uluru - Jason - was also great .... knowledgeable, social, informative, fun - one of the better guides on my Aussie adventure... I have to say it was one of the best parts of my trip to AUS. Sorry it took me so long to get back to you. Computer was brokjen down for last several weeks. First I wanted to thank you for the fantastic vacations we had at Ayers and in Kakadu. Obviously two completely different experiences. First on Kakadu. The passion of David for his land, his black friends and thei culture, the quality of his tour is just phenomenal. His tour not only met our expectation but also lead us to ask for more. So we have now to think about a longer tour in the Kimberley..... Not sure David would survive 10 days with my kids...... Altogether, a verry safe and verry well managed organization, great humour, fun for kids, and a fantastic mate. Second on Ayers. Completely differnet tour. Good value for the money. Great outdoor desert exprience, but little gained in terms of local culture. Not sure we coiuld have expected much more from Ayers, so overall probably best way to discover the place. Last, your advices were spot on. Your tours were well price. Your support and follow up on tour status was much appreciated. You and your team are doing a fantastic job in helping traveling in a land that is full of surprises. As you can see, a great experience overall Thank you. Say hello to David from Beatrice, Tigran, Samuel, Audrey, and Olivier D.
› Minimum rental is 5 days return or 7 days minium oneway. Please include this in your request for availability and quote. 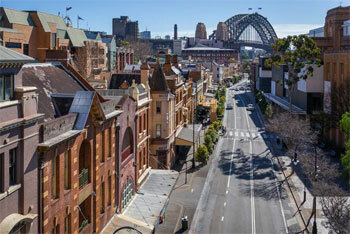 • We offer rentals from many locations in Australia so it's just a matter of emailing us. • One thing we appreciate are your full details when you ask us for a quote. • It's not to hound you but we do appreciate knowing that we can ring you to clarify your needs and desires on occasions - it makes a difference to us in quoting as we try to be very accurate on the products.